Deal Categories: Protein and Energy bars.Stores: Vitamin shoppe. 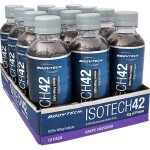 The price for the ISOTECH 42 – Protein Isolate RTD drops from $39.99 to $19.99 (half price and all-time low/apple riot flavor). Deal Categories: Protein and Energy bars.Stores: Amazon. The price on the Pure Protein Bars Gluten Free, Birthday Cake (6 bars) drop to $5.99 shipped with Amazon Prime. Deal Categories: Protein and Energy bars.Stores: All Star Health. 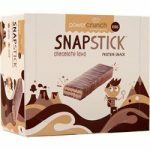 The price on the Power Crunch Snap Stick Chocolate Lava (12/pk) drop from $23 to $10.49 at All Star Health. This is the best total price we saw. Deal Categories: Protein and Energy bars.Stores: DPS. The price on the Icon Meals Protein Popcorn Canadian Maple – 10 oz Bag, drop from $6.99 to $5.59, with coupon code DPS10 during checkout at DPS.